We do our best to process and ship orders within 1-2 business days (Monday-Friday, excluding holidays). We will share your telephone number and email address with our shipping partner who may contact you to arrange a delivery time. We kindly ask that you choose standard shipping where possible to reduce our environmental impact. If you have any questions about your order, you can reach out to our Customer Service team and we will be happy to help. Patagonia EU ships to the following countries in Europe: Austria, Belgium, Bulgaria, Croatia, Cyprus, Czech Republic, Denmark, Estonia, Finland, France, Germany, Greece, Hungary, Iceland, Ireland, Italy, Latvia, Lithuania, Luxembourg, Malta, Netherlands, Norway, Poland, Portugal, Romania, Slovenia, Slovakia, Spain, Sweden, Switzerland and the United Kingdom. For inquiries regarding countries not listed above, please visit our US website for more information. Unfortunately, we are unable to ship to countries outside of Europe through our EU website. 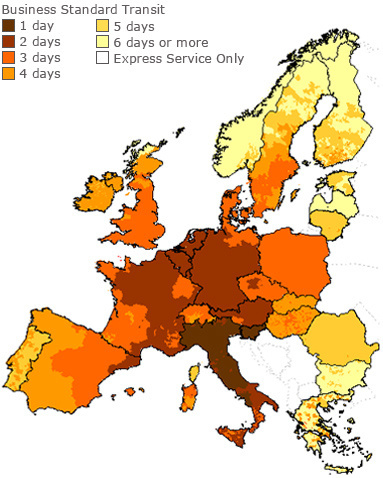 Patagonia Europe offers two shipping methods: Standard Shipping and Express Shipping (UPS Express Saver). Where a valid payment is available, orders are processed and shipped within 1-2 business days. Please note that for bank transfer orders, the payment can take up to three business days to reach us. Orders placed on Friday will be shipped the following Monday at the latest. Express Shipping: 1 business day from shipment (Mon-Fri)*. Please allow 1 business day for packaging. Free Shipping: valid on orders above £90, €100, 100 CHF, 950 SEK, 750 DKK and 950 NOK. *Please note that next day delivery is not guaranteed for the following areas: Canary Islands, Finland, Iceland, Isle of Man, Jersey, Norway or Switzerland due to custom or geographical issues. Please see the map below for more information on estimated transit times from our Dutch warehouse to your country of choice. Please note that 1 business day needs to be added for packaging the order in our warehouse. 1 business day for processing. 1 business day transit time. Estimated timeline (order placed to order delivered): 2 business days. Norwegian customers are required to pay the listed price on our website to complete the checkout process. Once your order is shipped, we will deduct the VAT from the total amount paid. The final invoiced amount will be reflected on your invoice which you will receive via email when your order leaves our warehouse. For credit card orders, the invoiced amount will be retrieved from your bank. For bank transfer orders, the VAT will be refunded to you within 1-2 business days. The payment should clear in your account in the following 3-10 working days depending on your bank. Please note that automatic VAT deduction can only be applied when both the shipping and billing addresses are in Norway. Please note that you will need to pay your national VAT, disbursement feeds and custom duties to the UPS carrier upon receipt of the goods: 25% VAT + customs fees (with a minimum of 155,00) + custom duties (status as of October 2012). Please note that Patagonia Europe cannot deliver to BFPO or PO addresses. We apologise for any inconvenience this may cause.